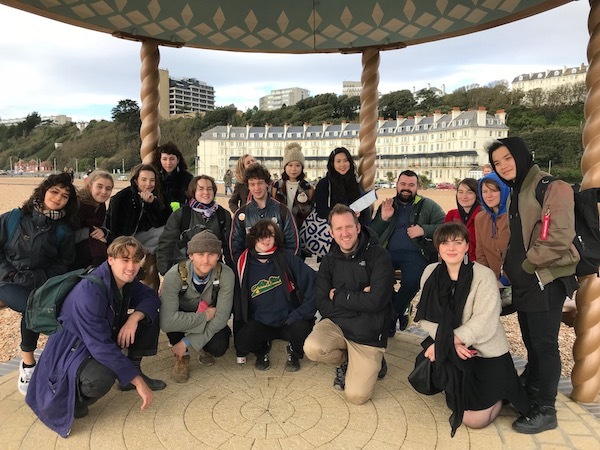 Lisa Milroy and Kieren Reed organized a trip for 104 Undergraduate, Graduate and PhD students with Gary Woodley and Lewis Biggs to the Folkestone Triennial. They were welcomed by Jennifer Thatcher at The Grand Hotel on arrival with an introduction from Lewis Biggs, and later viewed a performance by Emily Peasgood in a church setting. For more information about the Folkestone Triennial see: www.folkestonetriennial.org.uk.